BEIJING: Bihar chief minister Nitish Kumar has toured Shanghai, China’s financial hub, where he received first-hand information on advanced technologies in key sectors like infrastructure, agriculture and irrigation. Kumar, currently on a week-long “goodwill” visit to the Communist nation, saw various aspects of Shanghai, China’s largest metropolis. Issues related to scope of multidimensional use of IT in rural areas were discussed during his interactions with Chinese officials. Kumar also visited the R & D centre of ZTE, a Chinese telecom giant, in Shanghai. ZTE has opened a local office in Patna, the chief minister was told. Later, Kumar, who is leading a Bihar government delegation, also visited Shandong province, where experts gave a detailed presentation on building infrastructure, agriculture and irrigation. Issues related to alternative building material technology and brick, roofing material were also discussed during a function attended by Shandong province officials. Besides, issues related to water use efficiency for irrigation, tourism, Nalanda University, solar energy and methods to control floods were discussed, Bihar government sources said. Urban development minister Prem Kumar said that the department has planned to construct basins in Buxar, Hajipur, Begusarai and Munger towns for the cleaning of dirty water flowing into the Ganga through various drains. id="more-3167">The department has already invited tenders in this regard. The department was also working on similar project for implementation in 17 other towns located on the bank of the Ganga. HelpAge India organized a function to spread awareness regarding the need to overcome neglect of the aged and infirm people in the society. The function was organized on its premises. A report presented on the occasion also pointed out the neglect and crime committed against the old people in the country. It also referred to the prevailing situation in city. The Tara Institute of Learning based in Kankerbagh locality organized a five-day workshop on kathak style of dance, beginning Monday. An eminent folk singer, Bharat Singh Bharti, inaugurated the workshop which aims to acquaint students with the latest distinctive styles and compositions of Lucknow Gharana, said institute director Kiran Kumar. PATNA: Fifteen voluntary donors donated blood at Red Cross Blood Bank at north Gandhi Maidan on World Voluntary Donors day on Tuesday. Dr Binay Bahadur Sinha, Red Cross Blood Bank (Bihar) in-charge, spoke about the importance of blood donation. He appealed to all the healthy voluntary donors to donate at an interval of three months without fear. Dr SK Srivastava checked the health of the donors, who donated blood on the occasion. Meanwhile, the Bihar State AIDS Control Society, Patna, also organised a function to mark the blood donation day. Health minister Ashwini Kumar Choubey felicitated the regular blood donors on the occasion. Patna, June 13 (IANS) Pre-monsoon showers in many parts of Bihar Monday brought much-needed respite from the scorching heat, with the weather office saying the monsoon may arrive in the next couple of days. “The pre-monsoon rains are a good sign for the arrival of monsoon,” a Met official said. Patna and neighbouring districts also witnessed dust storms and cool winds prior to the showers, leading to a drop in day temperatures. “Monsoon is likely to hit Bihar between June 14 to 16,” the official added. After facing two consecutive drought years, Bihar is likely to receive normal rainfall this year, a good news for the millions of farmers in the state. Last year, the Bihar government declared all the 38 districts drought-hit due to a rainfall deficit of nearly 22 percent. Inadequate rains had severely hit paddy sowing and transplantation in most districts, barring Araria, East and West Champaran. In 2009, the government declared 26 districts drought-hit. PATNA: Deputy Chief Minister S K Modi today said the state government would soon frame Bihar Communications Towers and Related Structures’ Rule 2011 for regulating mobile towers in the urban areas. “We will soon frame the rule for the purpose of regulation of old mobile towers which have been set up without prior sanction and new ones to be set up within the urban areas,” Modi told reporters here. Modi said the new rule, if implemented, would help urban bodies earn Rs 50,000 per tower to be set up by mobile operators towards registration and payment of an additional Rs 15,000 per month for every tower. Manavadhikar Sanrakshan Pratistthan (Human Rights Protection Group) organised a seminar on "Justification of Parliamentary form of democracy in the context of violent and non-violent agitation" in Patna on June 15, 2011. Former Bihar Chief Minister Dr Jagganath Msihra delivered the key-note address. Bihar Players Association (BPA) president Mritunjay Tiwari and students observed day-long token fast in Patna on June 15, 2011 in protest against the police lathi-charge on CBSE class XII students who were protesting against the CBSE regional office for alleged large-scale irregularities in the class XII examination results on June 14, 2011. Bihar finished runners-up in the National sub-junior throwball championships held in Secundrabad recently. 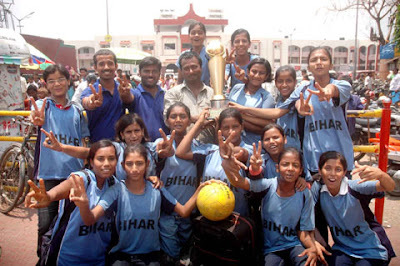 Bihar girls lost to Tamil Nadu in the final. 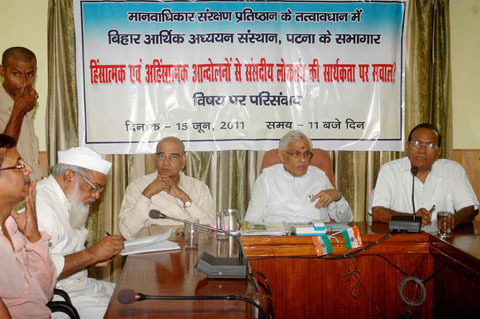 The team returned Patna on June 15, 2011. 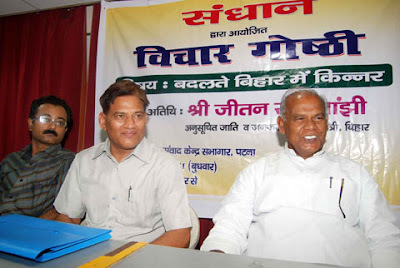 A non-governmental organisation, Sandhan, organised a seminar on " Eunuchs in changing Bihar" was organised in Patna on June 15, 2011. Bihar Scheduled Caste and Tribal Welfare Minister Jitan Ram Manjhi inaugurated the seminar. Addressing the function the minister said government was planning certain specific measures for the welfare of the eunuchs in the state.